Day 25 of the Insanity Asylum workout is in the books. This was my second time doing the Game Day and Overtime workouts in the same day and it was tough. My left knee acts up the second Shaun T asks us to do any type of jumping, lunging, or squatting. Most of the time my knee acts up because of the pace Shaun T sets. I have to slow down and it’s probably a good thing because it makes me focus on form. Results usually come faster this way anyways so I know it’s the right thing to do. 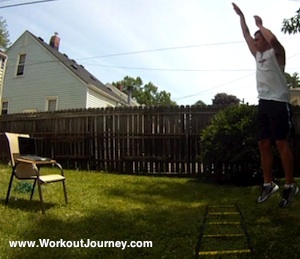 Doing the workouts outside has been a big plus as I can do all of the moves. Put on my Boombah Trail Resistance softball shoes and they helped out a lot in the grass and making cuts. After looking at the video I made I can see the results I’ve started to earn from doing the Asylum workout. My calves have started to take shape. My brother made a typical jerk comment saying how nice my calves looked after making a play at softball last night. I would have to say I agree with him though. Must be all the jump roping and agility ladder training. I still had to take a bunch of breaks along with modifying the moves. Some of the exercises are at the peak of my fitness level. I could probably do them if my knee was better and or those hard moves were not in the middle or the end of the workout. The Overtime workout was tough. Took a 2 minute break from the Game Day workout and went at it. I’d say I only did half of the moves Shaun T wanted asked us to do and the others had to be done with a slight modification. Only 5 more days of the Insanity Asylum workout to go.